Picture of Club Live Performing. Picture by Kenny Elrick. The Press and Journal Energy Snow Ball makes a keenly anticipated return to the Aberdeen business calendar later this year and the 2018 edition is shaping up to be even bigger and better than last year’s inaugural event. It takes place at in the Aberdeen Exhibition and Conference Centre (AECC) BHGE Arena on Saturday December 1 and, with the oil and gas industry in recovery mode, demand for tickets is likely to be strong. Held in association with North Sea helicopter operator CHC, other sponsors include Balmoral Group, Apache and ITC Hydraulic Services. Entertainment act Club Live wowed the audience with their music last year and are lined up to perform again. There are plenty of surprises planned for the night and details about these will be revealed soon. 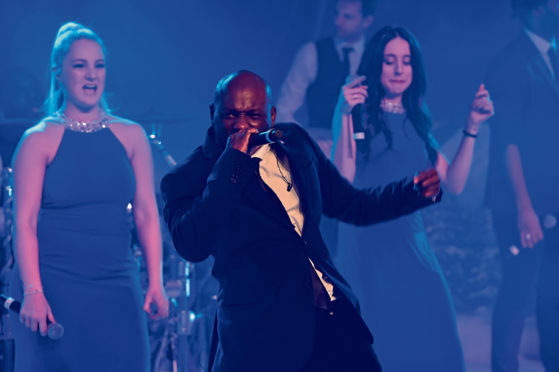 What is guaranteed is an excellent night of music and dancing, with a winter wonderland backdrop, for people across the energy industry to celebrate the end of another year. P&J editor-in-chief Richard Neville said: “The Snow Ball is all about celebration. “It is about taking time to reflect on the good work done and the exciting prospects ahead for the North Sea energy industry. It will also be one of the final chances to enjoy the AECC before a new £333 million venue, The Event Complex Aberdeen, or TECA, opens next year. People are still talking about last year’s memorable Energy Snow Ball, which took place in a glass marquee in the quadrangle at the world-famous Marischal College. Jack Frost and fairy-tale ice maidens welcomed guests who later danced the night away to the tunes of Club Live and former Spandau Ballet frontman Tony Hadley. One lucky guest pulled a once-in-a-lifetime helicopter ride out of a Christmas cracker, with the prize presented by Mark Abbey, of sponsor CHC Helicopters. For more details and individual ticket or table prices go to www.dctevents.com, or contact Laura Adam at laadam@dctmedia.co.uk or 01382 575308.